From the print edition of the Irish Independent, FuJo’s Eileen Culloty writes about disinformation and digital literacy as part of the launch of the Reuters Institute Digital News Report Ireland. The phrases “post-truth” and “fake news” are the lexical legacy of the 2016 Brexit referendum and US Presidential Election. They represent a shifting moral panic about the influence of social media on democratic societies. Internationally, this panic is sustained by revelations about Russian troll-farms, the misuse of social media data, and “micro-targeting” by companies such as Cambridge Analytica. Against this background, it is not surprising that news consumers are worried about “fake news”. The Reuters Institute’s Digital News Report surveyed news consumers in 37 countries; more than half are very or extremely concerned about “fake news”. Concern is highest in countries such as Brazil, Spain, and the United States where there is a confluence of polarised politics and widespread use of social media. In Ireland, some 57 percent of digital-news consumers are concerned about “fake news on the internet”. Most are concerned about stories that are completely made up for political or commercial reasons. However, when asked about their exposure to disinformation, only 17 percent had encountered stories that were completely made up. This suggests that concern is primarily driven by news about “fake news”. Indeed, Irish consumers report that they have mostly been exposed to use of the term “fake news” by politicians, presumably referring to media coverage of Donald Trump. The Digital News Report highlights the confusion that stems from ill-defined terms such as “fake news”. It has become a catch-all term that encompasses concerns about biased and slapdash journalism, political spin, misleading advertising, and deliberately fabricated stories. To overcome this confusion, a 2017 report by First Draft introduced a new definitional framework. It distinguishes three kinds of disordered information: mis-information is the sharing of false information without harmful intent; dis-information is the deliberate sharing of false information to cause harm; and mal-information is moving private information into the public sphere to cause harm. This framework is useful because it allows us to distinguish between the deliberate manipulation of content through fabricated stories (a concern for 61 percent), distorted facts (a concern for 59 percent), unintentional mis-information such as poor journalism (a concern for 56 percent of consumers), and adverts that look like news (a concern for 46 percent). When considering Irish attitudes towards addressing “fake news”, it is worth remembering the lack of conceptual clarify around the definition of the term. For example, 76 percent believe that journalists and media companies should do more to address the problem. This makes sense if poor and biased journalism are included in the definition of “fake news”. However, it’s not clear what journalists are supposed to do about the propagandistic use of the term “fake news” by politicians or the complete fabrication of stories on social media. Internationally, most respondents believe that media publishers (75 percent) and social media platforms (71 percent) have the biggest responsibility to address the problem of disinformation. For social media companies, the major difficulty is creating a content policy that can be consistently applied across different jurisdictions. There is no simple fix as efforts to restrict harmful content can have unintended consequences and those intent on causing harm find innovative ways around content policies. Since 2016, there has been a renewed interest in digital literacy as a potential corrective to “fake news”. It is hoped that digital literacy will equip media consumers with the necessary skills to negotiate the online environment. 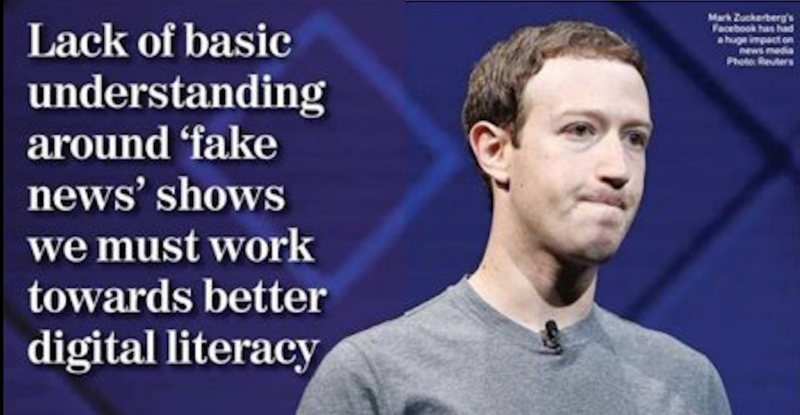 Earlier this year, a report by the European Commission’s High-Level Group on Fake News and Disinformation called for an increased commitment to digital literacy initiatives across Europe. In Ireland, the Broadcasting Authority of Authority of Ireland maintains the Irish Media Literacy Network to bring together relevant stakeholders. The findings of the Digital News Report certainly support the need for greater attention to digital literacy. Only 28 percent of Irish consumers are aware that the news in their Facebook feeds is largely determined by algorithms, which is in line with the EU average. The majority (73 percent) either didn’t know or believed journalists are employed by Facebook. Moreover, 33 percent think journalists and news outlets write press-releases for organisations; only 36 percent correctly identified the role of a PR spokesperson. This basic lack of understanding is worrying for the news media because it suggests that the public are largely removed from the important conversations that developed over the last few years about the sustainability of news media, the power of Google and Facebook, and the implications for democratic societies. In this scenario, we all have something to be very concerned about.